This year, I set out to run 15 races. Ya know, for 2015. I filled my calendar with lots of fun races during the first half of the year. I ran ten races before June and then during the summer, I ran a few shorter races for fun. Then, I moved on to the fall. I raced six times between September 26 and November 21 and I set four new personal records (PRs) during that time frame. In case you’re curious, I PRed the 10k, the ten miler, the half marathon and the marathon. While I did not set out to run that many races and I certainly didn’t set out for all those PRs (I really wanted to just PR the marathon this fall), I did learn some important lessons during all my races this year. You can easily incorporate races into your training – it just takes a bit of planning. I used a number of races as a part of my training. I picked races where the distance worked out to what I wanted to run (for example, I ran a 10k the weekend before a marathon and that worked out well) and didn’t gun for a particular time. However, I did let myself push it once I realized that I could PR in those races. Removing pressure can bring great results. When I ran the Richmond half marathon this year, I took all the pressure off myself and didn’t look at my watch until the last mile. I ran by feel the whole way and ended up running a PR. I felt no pressure and really surprised myself. Sometimes by removing the pressure you make sure to keep the fun. Listening to your body is KEY. After my 20th race, I felt a cold coming on and I was honestly just a bit tired of racing. So I’m taking a couple weeks of running on a schedule. I’m running what I want, when I want and not feeling bad about sleeping in or skipping a run. I’m still being active – walking, taking Pure Barre classes and the like, but I’m giving myself a break. Mentally and physically, I was ready for it after being in training what felt like all year long. I really want to kill it on my next training cycle (more on that in a later post) and in order to be ready to tackle that, I need some time off. A great group of training buddies can help get you through anything. The best thing I did this summer was join a new training group. Not only did I get a group of awesome run buddies, I made a group of new friends. 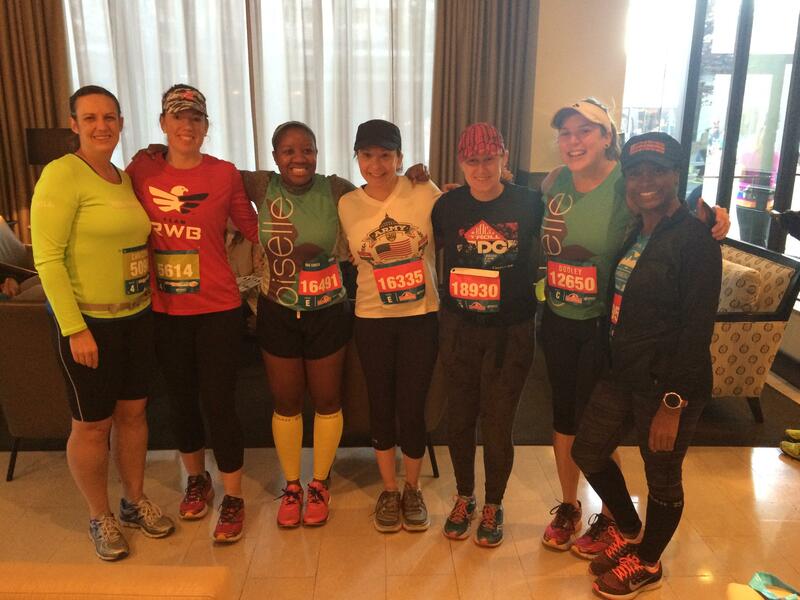 This group of women has been key to keeping me running happy this year. We trained together, raced together, traveled together and shared our lives. I’m so grateful to this group of women and it’s the best thing ever to have a supportive group of runner friends. I still can’t believe I finished 20 races this year – I didn’t set out to race that much but I learned so much this year in terms of running and I’m excited to see what 2016 will bring, running wise! How many races did you run this year? You did a lot of races this year–and you did well at all of them. It was really fun to see you crush those marathons! I ran more races than I usually do–I threw in that last minute half yesterday, which was fun! I did 4 halfs, 1 full, 1 10 miler, and 1 10k this year. And those virtual races too, altho I don’t really count those as “official”. It’s been a really fun year for me. I hope you had fun at your half yesterday – and can’t wait to see what 2016 has in store for you! Congratulations on your 20 races! 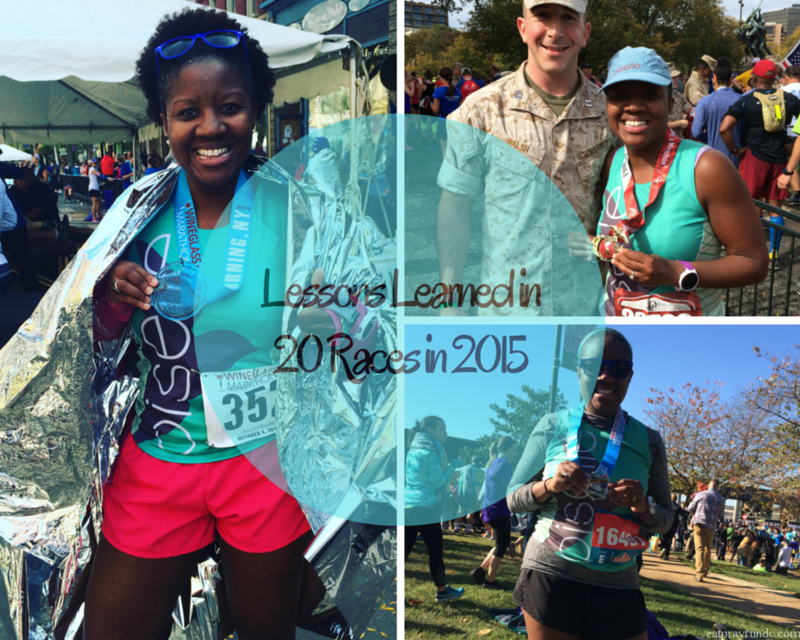 I also raced a lot this year and agree that you can easily incorporate them into training. I do a lot of 5Ks as workouts (I call it a “race-out”) and tempo runs. They make for great speedwork while running with friends and supporting a good cause. I also ran a half marathon as a long run this year and it helped a lot when preparing for my goal race. Racing a lot has helped me become better at racing, but I do agree you can overdo it (as I have done). I try to stick with 2 a month, though. Yes, the 5k as a workout is a really great option. I did that a few times this year. I’ve also done the 5k as a shakout run the day of or the day after a long run, which is nice as well! Congrats on your races! It’s fun to incorporate races as training runs into the schedule. I like to do that since it 1) forces me to run the distance 2) I usually run into friends. I have a question for you about the Blogher Network. How do you cross-post your post to Blogher so it “redirects” to your blog under the Blogher frame? I cannot figure this out. Kim recently posted…Amish Half Marathon Race Report- I conquered the hills! What a great year you’ve had! Having support and listening to your body are key! Such an amazing year for you! And yes, listen to your body and surround yourself with like-minded, strong and supportive people and you cannot go wrong. So much for you to celebrate!! Thanks Allie! 2015 was a good one – I’m excited for what’s coming next! Great job on running 20 races and setting some awesome PR’s. I am running my first marathon this weekend. I love your tip about finding a running group to support one another. I have been thinking about joining one here in town because I usually run by myself and the few times that I was in pace with someone on the trail I run it felt better just to have SOMEONE there with me. Great post! You have had SUCH a great year, Courtney! From PRs to racing for fun and everything in between, I have truly enjoyed following along in your racing adventures this year. I thought I’d try to slow it down a bit in 2016, but I’m already registered for 3 races so it’s not looking good – ha! Thirteen races for me and one more to go! Hope you had a great Thanksgiving holiday! I too love running races as part of a larger training plan. It helps to keep the long training runs fun and more interesting. You had a terrific year of racing and yes, your body will be happy with the time off now. I agree that you can run races and still have them be part of your training for bigger races. This year was a lean year of racing for me so I am hoping to add more races to my calendar for next year.Congrats on all those PR’s, they make the training so worthwhile! Congrats on all of your races and PR’s this year! I’m looking forward to a strong 2016, but I know that I need to take some of your advice and get rid of all the pressure I put on myself! I have to tell you that removing pressure before a race is so freeing. I think it definitely allowed me to run fast enough to PR at Richmond. It’s a beautiful thing! Wow! What an awesome year of running for you! All of the PR’s, amazing!! I haven’t tallied up my races yet but I’m way under what I ran last year, but I’m ok with that! You have been a little racing machine this year. It’s been so fun seeing your progression. Races as training runs help break up everything! I think the taking off the pressure part is huge. I need to be better about that! Yes, that part was huge during my final couple of races!